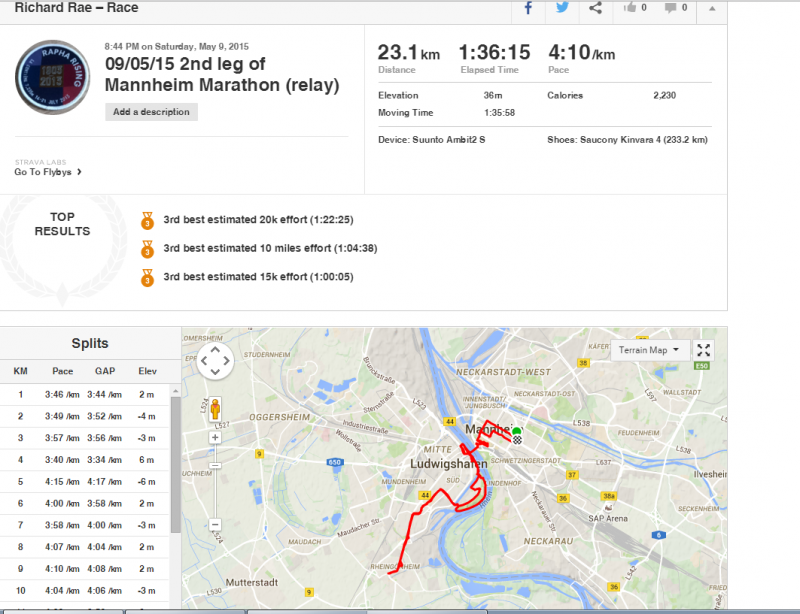 End of week 20 – Mannheim relay marathon and 4iiii FTP questions! On Monday me and Katja went for a 11.2km run. It was really humid and there were so many bloody flies, it wasn’t a very enjoyable run but was 11.2km at 5:27/km at 122HR. A quite easy start to the week. Tuesday I rode with my new powermeter for the first time. I had written a bit about that already, so won’t go over it again. It was blowing a gale though, as it always seems to be at the moment! On Wednesday I ran with Katja again, it wasn’t so horrible weather, but hella windy, which also wasn’t ideal. When we were done with the 11.5km loop, I cycled to the swimming pool for a swim. More accurately, I cycled 8km towards the swimming pool, before realising that I didn’t have my goggles. I know already from experience that without goggle, I am screwed as no one brings 2 pairs, and the pool doesn’t sell/rent or lend any out, so pretty pissed off with myself, I cycled home. On Thursday I decided to try a FTP test using my 4iiii power meter. Again I have covered that, but it appears that as I calibrated with my Suunto, rather than my Garmin, it might have been reading high. On my Suunto I got a 325w FTP, I will repeat using the garmin calibration when my legs are feeling good and I can be bothered! It was 63.7km ride at 32.6km/h with a Suunto NP of 280w. On Friday I went swimming. It wasn’t as bad as I had feared. I did 2.5km with mostly 200m intervals at about 3:50/200m, with some quite a bit faster. I don’t feel like I am getting faster, but I guess swimming once a week might explain that mystery! On Saturday I cycled 43.4km in the early afternoon at about 33km/h, before heading to Mannheim for the Mannheim relay marathon. I just wrote a race report, but lost it when trying to import the strava file, so here is a very short version. I wasn’t well prepared, I didn’t run well, I ran 23.1km in 1:36, but had a few really bad km near the end when I needed a toilet but couldn’t find one. I wasn’t really bothered about this race, but still had hoped for better. That was the end of my running season, I plan 2 weeks of just easy running now, then start with some faster stuff again. Today I had planned a long ride and swim, but I woke up with my calves killing me! I went into town to watch and cheer on the mainz marathon runners, then came back and cycled 65km after a little nap! This time it was at 32km/h with a Garmin 248w NP. It hurt my 1800KinMay challenge a little, but I only fell 42.1km short of my 300km goal for the week.